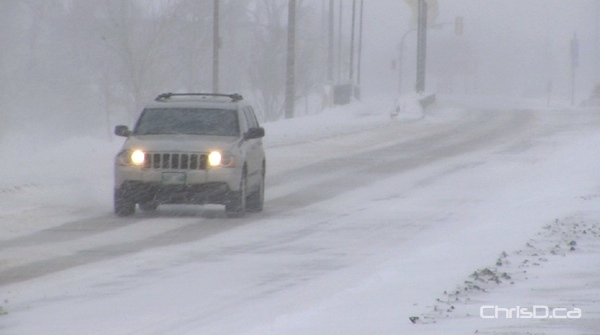 Snow-packed roads and icy conditions caused by overnight snowfall in Winnipeg triggered several collisions on Sunday. A taxi cab lost control and slid into the front of United Way’s headquarters at 580 Main Street just before 9 a.m. Witnesses on scene reported the taxi hit a van prior to striking the building. No one was hurt. The snow also led to several minor collisions inside the city, and reduced visibility on area highways. According to Environment Canada, the city was only on track to receive between 2-4 centimetres of snow by this afternoon. High winds, however, were creating blizzard-like conditions and making for a tricky drive. The Trans-Canada Highway both east and west of Winnipeg was reported to be partly snow covered with swirling snow in traffic. Drifts were also an issue on the Perimeter Highway in the passing lane, but plows were out earlier, along with sanding trucks.